The NCAA took over the national basketball championship tournament in 1940 from the National Association of Basketball Coaches. One team was chosen from each of the eight NCAA districts. Four of them competed in a western tournament and four in an eastern tournament, the western and eastern champions then played off. This system continued until 1950. The championship was expanded to 16 teams in 1951, with 10 conference champions automatically qualifying and 6 at-large teams selected. The move to the "Final Four" came the following year, when the number of regional tournaments was increased from two to four. In 1954, the number of teams increased to 24, with 15 NCAA conference champions and 9 at-large teams. The number varied a little until 1975, when a 32-team bracket was adopted. It has increased twice since 1975 to 48 in 1980 and to 64 in 1985. The number of conference champions automatically qualifying is subject to change from year to year, but under NCAA rules they can make up no more than half the teams in the tournament. 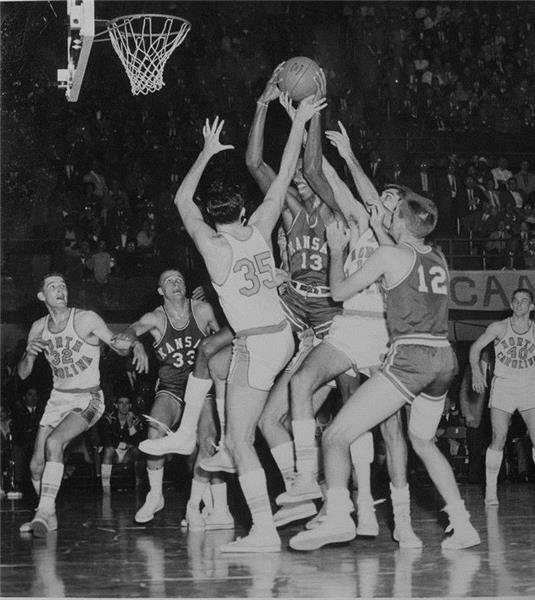 NCAA basketball tournament title in 1955.